SIPRI released new data on the world’s largest arms-producing and military services companies—the SIPRI Top 100. 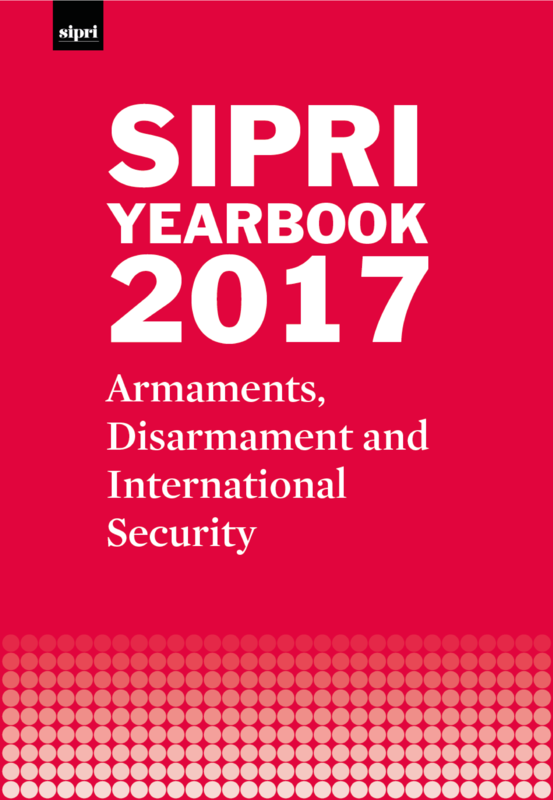 The report found that the total arms sales of the SIPRI Top 100 in 2016 is 1.9 per cent higher compared with 2015. This is the first year of growth in SIPRI Top 100 arms sales after five consecutive years of decline. Translations of the press release are available in Catalan, French, Russian, Spanish and Swedish. SIPRI is pleased to launch a package of materials on Article 36 reviews. The new work examines the challenges posed by emerging technologies to the legal review process imposed by Additional Protocol I of the 1949 Geneva Convention—and how requirements of Article 36 apply to key emerging technologies and support transparency in the area of weapon reviews. The third phase of the New Geopolitics of Peace Operations focuses on the role of peace operations in dealing with non-traditional security challenges. SIPRI launched this phase of the research with the publication of the Background Paper ‘Multilateral peace operations and the challenges of terrorism and violent extremism’ and the organization of a dialogue meeting on the same topic. SIPRI convened the inaugural meeting of the Malian Women’s Network for UN Security Council Resolution 1325 on 23 and 24 November 2017 in Bamako. The meeting was supported by the Embassy of Sweden in Mali and in partnership with the Malian National Coalition of Civil Society for Peace and the Fight Against the Proliferation of Light Weapons (CONASCIPAL). The Swedish Government has formally appointed Dr Jessica Tuchman Mathews to the SIPRI Governing Board. Next month, Gudlaugur Thor Thordarson, the Minister for Foreign Affairs of Iceland, will visit SIPRI to speak at an event. For more information, please contact SIPRI Communications Director Stephanie Blenckner (blenckner@sipri.org). SIPRI hosted European, Japanese and US experts from various technical, industry, legal and academic backgrounds to explore cyber definitions, cases of cyber intrusion and attack, and response and cooperation at the national, regional and international level. Overall, the workshop identified commonalities and differences on cyber security and cyber norms in critical infrastructure, while proposing cooperative initiatives for the future. SIPRI hosted Beatrice Fihn, the Executive Director of ICAN and 2017 Nobel Peace Prize Laureate, and Ambassador Rolf Ekéus, SIPRI Distinguished Associate Fellow and former Director of the United Nations Special Commission on Iraq, for an exclusive roundtable discussion on the future of nuclear disarmament. Ambassador Jan Eliasson, Chair of the SIPRI Governing Board and former Deputy Secretary-General of the United Nations, and Dan Smith, SIPRI Director, also shared perspectives. For more information, please contact SIPRI Communications Director Stephanie Blenckner (blenckner@sipri.org). SIPRI, together with the Swedish Ministry for Foreign Affairs and the Stockholm Resilience Centre, hosted a high-level seminar to reflect on strategies to address climate-related security challenges. The seminar featured keynote speeches from Margot Wallström, Swedish Minister for Foreign Affairs, and Isabella Lövin, Swedish Minister for International Development Cooperation and Climate. Arms sales of the world’s 100 largest arms-producing and military services companies (the SIPRI Top 100) totalled $374.8 billion in 2016, which represents a 1.9 per cent increase compared with 2015. This Fact Sheet lists the SIPRI Top 100 for 2016 from the updated SIPRI Arms Industry Database and describes trends in international arms sales that are revealed by the new data. This SIPRI report presents the authors’ key takeaways from a conference convened by SIPRI to discuss the importance of, and challenges associated with, Article 36 reviews. The report identifies three emerging fields of technology: cyberwarfare technologies, artificial intelligence and robotics, and human enhancement. It establishes that, although these three technology areas are at various levels of maturity (from mature to still emerging and experimental), it is undisputed that they will have a dramatic impact on the future of warfare as they all have the potential to fundamentally change how force is applied, and the way critical decisions are made, on the battlefield. The report also finds that despite their technical and operational differences, the military applications derived from these areas raise similar challenges as far as the conduct of Article 36 reviews is concerned. To encourage more widespread compliance with the obligation of Article 36 and support confidence building in the area of legal reviews, SIPRI has developed a compendium of existing national Article 36 review procedures. The compendium describes how the review process is conducted in nine countries: Belgium, Germany, the Netherlands, New Zealand, Norway, Sweden, Switzerland, the United Kingdom and the United States. The country presentations are based on responses to a questionnaire that SIPRI submitted to relevant authorities. Each presentation summarizes the format and responsibilities of the reviewing authority, how states interpret the terms of reference and legal obligations of Article 36, and the methods employed to conduct the review. China’s Belt and Road Initiative (BRI) is the result of a convergence of multiple Chinese domestic drivers and external developments. It holds significant potential to contribute to greater connectivity and stability in participating states, yet there is a need to include a wider spectrum of local and international stakeholders in order to address concerns and mitigate backlashes. As shown in this SIPRI Insights Paper, projects on the scale of those implemented within the BRI inevitably become part of existing local and cross-border security dynamics. They may also expose, and sometimes exacerbate, local institutional weaknesses. Examples of these issues are revealed through the case studies of Belarus, Myanmar and Uzbekistan. In recent years, United Nations missions have been the frequent target of terrorist attacks, while non-UN operations have fought against violent extremist groups. Given the prospect of peace operations in countries considered hotbeds of terrorism and violent extremism, the challenges of terrorism and violent extremism are likely to become a common, if not predominant, feature of mission areas. Thus, multilateral peace operations are under pressure to address terrorism and violent extremism more actively. Against this backdrop, this SIPRI Background Paper explores the terrorism and violent extremism-related challenges that multilateral peace operations face in their efforts to create and implement effective missions. This paper seeks to inform the discussion surrounding the European Commission’s proposed ‘recast’ of the EU Dual-use Regulation—the main regulatory instrument for EU member states’ controls on the trade in dual-use items. The proposal, which is currently being examined by the European Parliament and Council of the European Union, is part of a review of the Regulation which was launched in 2011. Climate change poses a new class of security challenges that is confronting societies worldwide. Increased risk of famine, destroyed infrastructure, houses and shelter, and violent conflicts might all be consequences of climate change through gradual changes to ecosystems and extreme weather events. As a way to mitigate these challenges, states have delegated increased power to intergovernmental organizations (IGOs). This Fact Sheet summarizes the key findings of the first systematic review of research on IGOs and climate security, and the implications of existing studies for the theory and practice of global climate security governance. the sustaining peace framework of the United Nations. or post: SIPRI, Signalistgatan 9, SE-169 72 Solna, Sweden. This message was sent to [agnEMAIL]. 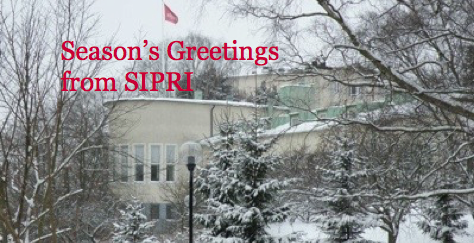 If you would prefer not to receive emails from SIPRI, simply unsubscribe.